In Sri Lanka, the Judicature in its historical setting dates back to the period of ancient kings centuries before the Portuguese, Dutch and British occupations. The king was the fountain of justice and every subject, however humble his station in life may have been, had the right of personal access to the King to obtain redress for his grievances. Dr. A. R. B. Amarasinghe, a former Judge of the Supreme Court has in his invaluable treatise titled “The Legal Heritage of Sri Lanka” included an interesting section as to the appellate Jurisdiction of the monarch. It is revealed that in ancient Sri Lanka we have had an elaborate system of Administration of Justice, spreading to different levels of hearing which served the needs of the people. It was based on an initial decision at village level by an official known as “Grama Bhojaka” and thereafter an appeal to a provincial Judge described as “Janapada Bhojaka”. Later to a final appeal to the King himself. The Mahavamsa records that there was a “Justice Bell” “Vanischaya Ghanta” which was tied to the head of the bed of King Elara, who ruled this country for 44 years and which could be rang by means of a rope that was tied to the palace gate by anyone who suffered injustice. During the time of the last of the Sri Lankan monarchs, there was a hierarchy of Courts. There were the village councils or the Gamsabhawas, comprised the elders of each village, the District Councils or the Rata Sabhawas composed of the leaders of the villages, the Courts of the Government Officers, such as the Courts of Vidana, Liyanarala, Koralas and Arachchis, Mohottalas, Wanniyas and chiefs of Uda Rata, Dissawas and Adigars. From these Courts an appeal was finally granted to the King who exercised supreme appellate powers. The Gamsabhawa or Village Council was the lowest Court in the elaborate judicial system during the time of the Sri Lankan kings. It is presumed that the Gansabhawas must have existed from about 425 B.C. which is approximately the date on which King Pandukabhaya established village boundaries over the whole island. This Court which met at the Ambalam or under a shady tree heard cases involving debts, petty thefts and boundary disputes. The essential feature of this Court was the endeavour made to settle amicably the disputes between parties. The procedure was simple and there was an appeal to Rata Sabhawa or the Koralas and ultimately through the hierarchy of various Courts to the King. The Gamsabhawa presided over by the Vidane functioned during the Portuguese period. They functioned also during the Dutch times. In Kandyan Kingdom of ancient Sri Lanka the Gamsabhawas continued until the British conquest in 1815. The system that we have now commenced with the Charter of Justice introduced by the British in the year 1801, which established the Supreme Court with two Judges; the Chief Justice and one other Judge. This brought about for the first time a separation between the Governor who exercised executive and legislative power and the Courts which exercise judicial power. Thus a firm tradition of separation of power was established which forms the bedrock of the rule of law. The Charter of the April 18, 1801 also established a Court of record styled the High Court of Appeal with jurisdiction to hear and determine appeals from any Courts of Justice in Ceylon except the Supreme Court of Judicature. The Judges of the High Court were the Governor, the Chief Justice, the other Judge and the Secretary of State or any two of them. This Court had its own seal. There was to be an ultimate appeal to the King in Council. By the proclamation of the August 20, 1801 English was made the official langauge of the Courts. The Charter of 1833 while completely reorganizing the Courts system and creating an exclusive jurisdiction both civil and criminal in the newly established Courts and the new Courts which the Charter of 1833 set up throughout the country enjoyed a superior prestige. In 1871, the Village Communities Ordinance No. 26 of 1871 was enacted giving recognition to village tribunals which began to exist as the smallest court of first instance in the island. The Presidents of these Courts were assisted by councillors and the Government Agent exercised a sort of paternal control both judicially and administratively. The Government Agents were empowered to sit with the President and councillors and generally from time to time to report such proceedings to the Governor. An appeal was provided to the Government Agent and from the Government Agent to the Governor. There was no provision for legal representation. The persons who were appointed as presidents were not professional men but were the products of Kachcheri training. The courts Ordinance that came into force on August 2, 1890 consolidated the laws with regard to Courts and their powers and established the Magistrate’s Court, the District court and the Supreme Court. This structure continued till the Administration of Justice law was enacted in 1973. Before dealing with the changes in 1973, it is essential to consider the changes occurred in village tribunals which existed as the smallest Court of first instance in Ceylon. The Rural Courts Ordinance became law in 1945. Under this Ordinance the President of the Rural Court began to function alone without the assistance of assessors. These Courts which were being treated as subsidiary departments of the Kachcheri now began to function as independent people’s Courts of small causes. But the Ordinance sought to keep the essential feature of these Courts by preserving its main function, namely, to effect amicable settlements of dispute between parties. In the modern history of Ceylon legal system, the Conciliation Boards Act No. 10 of 1958 stands out as a bold experiment. The Act was intended to encourage the amicable settlement of “petty village disputes” and thus avoid bad blood, costly and time - consuming litigation, and crime inspired by such petty quarrels. The Court’s structure came into force on 1890 continued till the Administration of Justice Law which was enacted in 1973, which established for the first time the High Courts in this country. The High Courts thus established functioned in the respective zones throughout the country and were not rested with appellate jurisdiction but exercised only the original criminal jurisdiction hither to exercise by the Supreme Court. In 1978, all Conciliation Boards in existence were dissolved and the Conciliation Boards Act was repealed by the Judicature Act No. 02 of 1978. 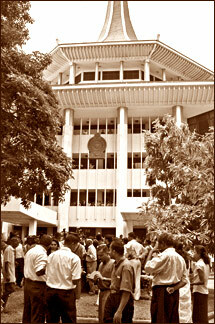 The Judicature Act was part of the constitutional re-arrangements which accompanied the new Constitution of Sri Lanka. The Courts of first instance set up under this Act made a considerable departure from the existing Courts. The Judicature Act introduced a new court called the Family Court with some original jurisdiction in respect of matrimonial disputes, actions for divorce, nullity and separation, damages for adultery, claims for maintenance and alimony, disputes between spouses, parents and children as to matrimonial property, custody of minor children, dependant’s claims, guardianship and curatorship matters, claim in respect of declaration of legitimacy and illegitimacy and marriage, adoptions and applications for amendment of birth registration entries, claims for seduction and breach of promise of marriage. By the Judicature (Amendment) Act No. 71 of 1981, the Jurisdiction in respect of claims for maintenance was transferred to the Magistrate’s Court. A new concept of an officer known as a Family Counsellor was introduced by Section 26. Section 26 has now been amended by the Judicature (Amendment) Act No. 71 of 1981 attaching the Family Counsellor to a judicial district instead of to an individual court thus making him available also to the Magistrate’s Courts within that District. This was necessary because of the transferring of the jurisdiction in respect of claims for maintenance to Magistrate’s Courts. The Judicature Act also introduced a new Court called the Primary Court whose jurisdiction included original civil jurisdiction where the debt, damage, demand or claim does not exceed Rs. 1,500 and exclusive criminal jurisdiction in respect of such offences as may, by regulation, be prescribed by the Minister. The Section 34 of the Judicature Act is amplified by Section 31 and 44 of the Primary Courts Procedure Act No. 44 of 1979. The next change came with the enactment of the present Constitution in 1978. It established for the first time the Court of Appeal. The appellate jurisdiction hither-to exercise by the Supreme Court was vested in the Court of Appeal and the Supreme Court was vested with Constitutional jurisdiction and jurisdiction as the final appellate court. A two tiered appellate structure was thus created with the first appeal to the Court of appeal from any original court to be availed of as of right by an aggrieved party and a second appeal to the Supreme Court to be exercised only with leave to be granted in respect of substantial questions of law or where the matter was considered fit for review by the Supreme Court (Article 128 of the Constitution). This innovation of the establishment a Court of Appeal to which all appeals then pending before the Supreme Court stood removed brought about a delay in the process of disposing of appeals. The fact that there was another appeal to the Supreme Court made it incumbent on the Court of Appeal to deliver considered judgements on all matters that were decided upon slowing down the pace of disposal to a point where the court accumulated a backlog of nearly 19,000 appeals by the year 1993.